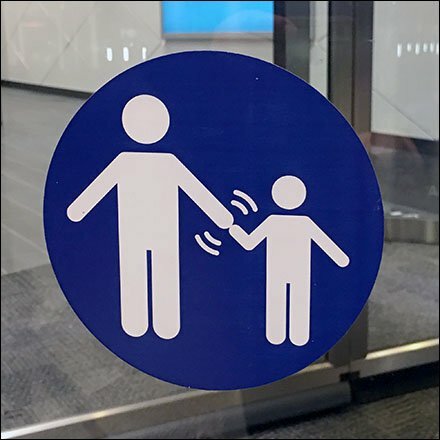 Lovers or not, like your kids or not, this Please Hold Hands Revolving Door Warning suggests that keeping in touch is appropriate for traversing the moving portal. But in an emergency there is a fail safe device in the form of a cutoff swith above and beyond the Revolving Door Warning. I might have signed that a bit too, but you get the idea from the Emergency markings alone. Seen at King of Prussia Mall, Philadelphia. I observed customers using singly and in groups and it worked perfectly. Though I did not observe one instance of Revolving Door Warning hand holding. Consider this Please Hold Hands Revolving Door Warning from various distances in the gallery of images. Follow Simon and the King of Prussia Mall at….